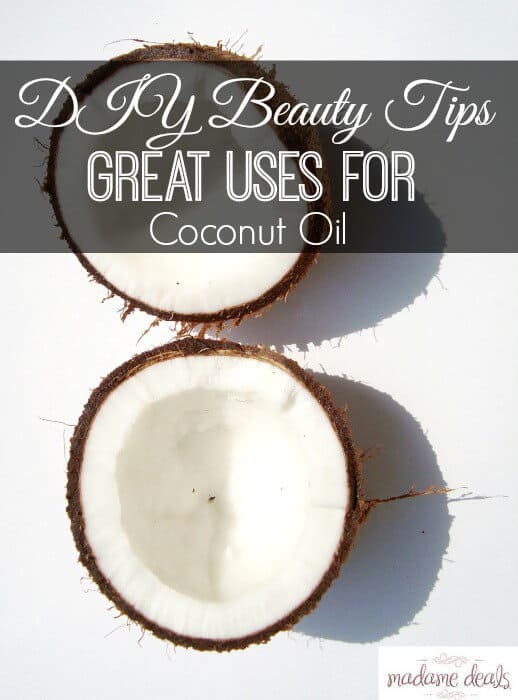 Coconut Oil is the ULTIMATE Beauty Tip! If you haven’t grabbed it yet, trust me, it will be a favorite. From regular use in your kitchen, to totally revamping your beauty routine, this is the ultimate ingredient! I have to share I am a huge fan of DIY beauty tips. I love to make my own body scrubs with items in my kitchen. I mean did you see this sugar scrub? I made it for the teacher’s at the school and they loved it so much I came in and taught the students how t0 make it. You can image how happy I was to discover something I had in my kitchen was multipurpose and amazing. This miracle is coconut oil. I have been using it on my lips and on the bottom of my feet since my heels get really dry. Then get this I figured out it keeps my skin soft on my face. It gets better. I can use it to keep the frizz out of my hair. I really do believe in finding products that have multiple applications and that are easy to use and inexpensive. We have been doing a series on DIY Beauty tips that you can’t miss. We have conquered almost every area of your person without fail and without a lot of expense on your end. We believe inner beauty shines through but a little bit of up keep can make all the difference. You can see what I mean. I am giving you the real live version so you can see my diy beauty tip in person so to speak. Do you have a DIY beauty tip? Share it with us below.